Fatima Darwish is telling the group about her life now, much different than the one she left behind in Aleppo, Syria. Back then she was the equivalent of a junior high school teacher, instructing several subjects from physics to Arabic. Now she’s hoping to get onto the teaching rolls of a privately run Toronto Arabic school. Despite perfect fluency in English, she isn’t optimistic of her prospects of teaching in the Canadian public school system. “There’s no space for me, maybe next year I will try again,” Darwish said. “It’s hard because you need Canadian experience to get a job, and we are all newcomers. The women make small talk, exchanging smiles and a few laughs. They’re prodded gently by meeting facilitator Roula Ajib to practise their English. Some can only speak a few words, others are almost fluent. Most of them are of Syrian origin, having arrived in Canada a little more than a year ago. With the help of the community centre, the women learn English, plan careers and focus on the next chapter of their lives. They also get a rare opportunity to speak openly about their feelings and the trauma suffered from the civil war in their homeland that has left hundreds of thousands dead in almost seven years. 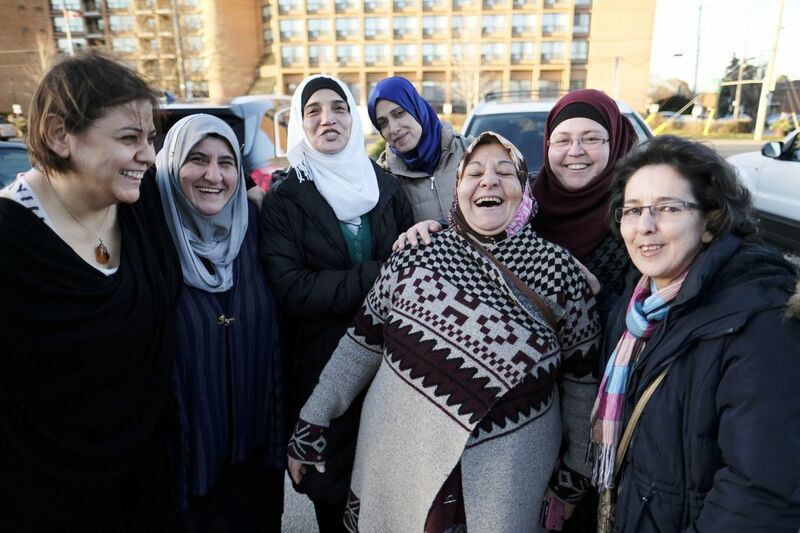 “The women get to express themselves,” said Bayan Khatib from the Al-Quazzaz Foundation for Education and Development and the Syrian Canadian Foundation, which runs a group therapy program for Syrian women new to Canada, focusing on mental health. During the sessions, a therapist offers counselling, and the women can take part in yoga as well as learn more about wellness, from eating healthy to engaging in self-care. After years spent in a refugee camp in Jordan, Nadima Abdolahaq arrived in Quebec, where she studied French. Now in Toronto, she studies English at an ESL-equivalent program with hopes of pursuing a career in daycare. Like many of the women, she is a mother, with five young children. Almost everyone in the group has lost loved ones to the civil war. Abdolahaq, who lived in a suburb of Damascus, says 50 members of her family have died, including a cousin whose death she learned of the same day. Other relatives are imprisoned or facing torture at the hands of the ruthless Syrian regime. “I expect I’ll never see my brother or sister again, and they are my only family left,” she said through an interpreter. Other group members offered support, promising Abdolahaq in Arabic she will one day return to her homeland, if only for a visit. “We’ll all go together and you’ll cook for us when we get there,” they say laughing. All of the women agree they consider Canada home now. They face heavy obstacles for full integration, but feel empowered by gatherings such as these.